Lugar de Bandama, s/n, 35017 Santa Brigida, Spanje. Hotel VIK Bandama Golf is located at a height of 400 metres in a protected area, the Natural Monument of Bandama: a place where the lush green of the native vegetation seems to melt into the blue of the sky. Surrounded by beatiful gardens full of native plats, it is just 10 metres from the 1st tee. 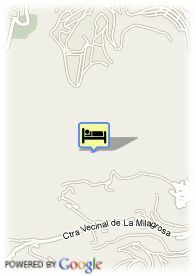 Just 20 minutes away from Las Palmas de Gran Canaria and 25 minutes from the airport. VIK Hotel Bandama Golf maintains all the charm of the English style in the decoration of its 34 rooms - 27 double rooms, 6 single rooms and one suite, with magnificient views over the golf course, the putting green or the awesome crater the Hotel is named after. The perfect place to relax playing golf.